Submitted by Migrate Wizard on 2014-09-19 19:32. ChainsawXIV's and Jake Zahn's The Complete Craftsman 1.175. If you have any of these mods installed, remove them first. If you are upgrading this merge distro, you should remove the previous versions, too. Unzip the contents of the file to your custom content folder. On a PC that is ..\My Documents\Neverwinter Nights 2\. I started this as a personal project, and while researching certain things I saw that people were still clamoring for combos like this. So, I figured I would release my work as starting place for those that might want to combine these mods, and others, together. I'm a stickler for documentation, so I've included pretty much everything I've done along the way. That document alone may help people who want to try their hand at merging mods. I'm out of ideas, any fan favorites to recommend? IMPORTANT NOTE: If you are upgrading to version Beta 0.10.0, you MUST completely remove all the previous merged content and clean install to the override folder. I moved some stuff around that will mess your game up if you don't remove the old stuff 1st. See documentation for complete change log. Found a bug that needs squashing? Got a fix for something I broke or left out? Have a recommendation for new content? Just want to say thanks? Then please, leave a comment or send me an email. For those that are just curious, or for people looking for a make-shift guide on how to merge mods with common TLK, 2DA, and script (NCS/NSS) files. Now included in the merge distro. Use this file if your toons are standing around instead of fighting. This is compatible with stand-alone installs of KPrC and TonyK's AI. This distro is not necessary. Back up older versions of this file; place in TonyK AI folder, overwrite old version; also place in KPrC folder, overwrite old version. Contains all files necessary to play. Includes documentation and AI file. Does anyone know how to remove the glowing eye trail effect from tiefling & aasimar races? I tried deleting the entire folder of "Light emitter in spell effects" (SFX_v1.10) but its not working. 1. Every character needs to "reset weapon" function and then set it again. You should manually add weapons and shields to character, then right click on the weapon and click on "melee weapon" (if it is ranged weapon then goes to "ranged weapon"), on shield also. 2. MAKE SURE you turned off Auto weapon switch for AI! Now melee AI characters should move and attack the enemy. *UPDATE*! JUST DELETE FILE cmi_player_equip.NCS in Documents\Neverwinter Nights 2\override\zzz_KPrC_SFI_TCC_merge\Scripts and you are happy to go! Hi, I really like it. Some of the races doesn't really make sense in solo like MotB but for that might just be me :P.
I have a problem though, am I the only one to get a exp points bug in MotB? I chose to try a necromancer and used multiple ones on the earth elementals in the beginning, and i got like 480 exp points instead of the normal 128 exp points. I sure hope it can be fixed somehow because playing as a undead summoner is fun now., but the exp bug makes the game unplayable as you level too fast. Does anyone know who the original author of this is and how I could contact them? RedRover is the original author and has an e-mail address available in the documentation under 'Contact Info'. Can't seem to use this pack... with no other overrides other than the ones in this package, when I select class during level up only the base and prestige classes from the original game show up. A whole bunch of empty/blank class selections show up, but there is no actual class name in the selection box or description to the right. not sure if anyone is still looking at this, but thought I would throw this comment here in case anyone is monitoring and/or anyone else has had this issue. You have to edit the file "appearance.2da" and remove the entry for the glow effects. There are huge issues with the spell fixes component of this pack. In particular, the version of spell fixes used is the "pnp" version which makes changes to the spells to bring them in line with pnp versions. Unfortunately, this results in huge balancing issues and other bugs. -Improved and greater invisibility is no longer removed when attacking, but the listen check to let you attack the invisible targets does not work. I had a barbarian with high listen and the combat log showed no listen rolls at all, and i could do nothing but stand there and get magic missiled to death in the arcane brotherhood outpost in SOZ. -Wail of the banshee is missing all description text for some reason. -Flame arrow does not work, because although the script uses the flame arrow script name : NW_S0_FlmArrow, the actual code in the script is for Resist Energy. Im not even sure which of the spell bugs im encountering now are due to the spell fixes component or are vanilla bugs. Im not sure which files in the script folder are from the spell fixes component either, because its not seperated into sub folders and all the scripts are lumped together into one folder. Im seeing a lot of strange issues...hold monster does not work, most of the bigby spells do not work either. I can appreciate the hard work put into these packs. There are just to many issues to give this a high score. None of the new spell have a spell description. You can't scribe the scrolls using the new spells. Not one of the feats or races have any kind of description. As mentioned above several of the spell from the other mods no longer work or their descriptions are gone. At least two original classes no longer have descriptions ie Barbarian and Fighter. There are more problems I'm just tired of trying to think of them all. I hope some day these issues can be fixed. This pack could be a lot better, but it is the best thing out there. I give this score for the attempt and the shear amount of effort it took just to get this out. Good luck with anything you do in the future people and thanks. Finally, I have managed to find which file causes companion do not attack the enemies. 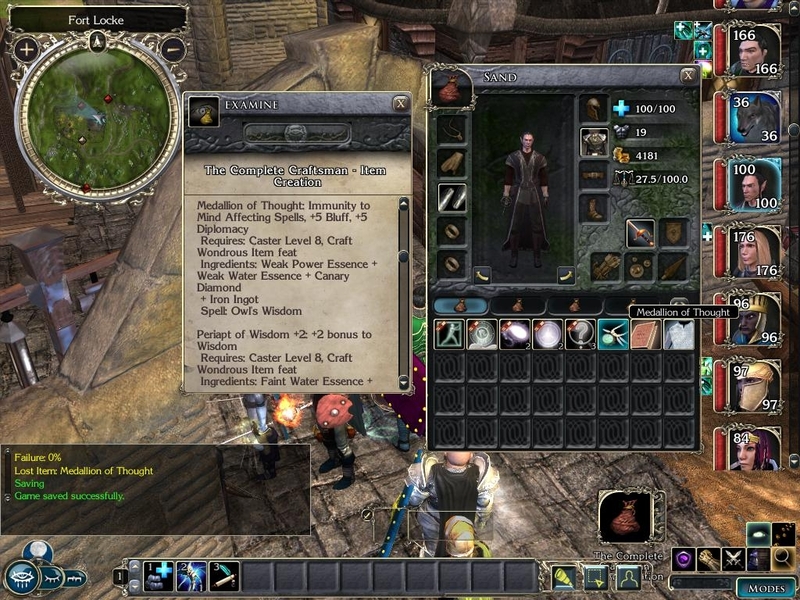 The file cmi_player_equip.NCS in Documents\Neverwinter Nights 2\override\zzz_KPrC_SFI_TCC_merge\Scripts if you just delete it, companions will act as normal and will attack enemies. Since I'm not a scripter, would like to get advice if anyone knows what is this file responsible for and what it does and if it affects something this merged pack if you delete it.